Marcellin Berthelot fashioned his vision of science and sweetness at a moment that many at the time regarded as a watershed in human history. In the 890s, the world’s nations battled for control of dwindling global resources. Famines raged in India, Russia, and other parts of the world. Global population surged to new heights but so, too, did the number of humans living in cities, and as everyone knew, city folks relied on others to grow food on their behalf, and farmers worldwide struggled to keep up with demand. In the U.S., then as now the world’s foodbasket, politicians, economists, and do-gooders bemoaned the crude state of American agriculture. Many people favored reorganizing farming so that it mimicked the factory, the better to supply the world’s foods. So it's not surprising that as the nineteenth century gave way to the twentieth, food was viewed universally as a crucial component of nation building, as important as navies, guns, and bullets. Common theory linked food to national power and racial superiority: the quality and quantity of a nation’s diet predicted whether it would dominate or be dominated. In Europe, Great Britain, and the U. S., scientists like Berthelot raced to unravel the components of foodstuffs, obsessed with extracting every ounce of nutriment from every inch of soil or, better yet, from every test tube and microscope. So meat there must be, if not from the farm then from the lab. “A lump of coal, a glass of water, and a whiff of atmosphere contained all the nutritive elements” of both bread and beefsteak, one writer observed in 1907. (*3) Science only needed to unravel the equation that would turn matter into meat. 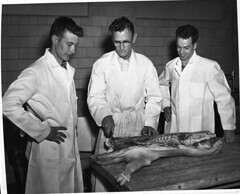 Many applauded in 1912, when Jean Effront, a Belgian chemist, announced that he’d manufactured “artificial meat” from brewery and distillery wastes. (*4) Effront washed and compressed the wastes and doused them with sulfuric acid, rested the mixture a few days, and then added lime to neutralize the acid. Once the liquids evaporated: Voila! A product that contained the same “albuminous elements” as were produced in the human body by digested meat, but with three times the nutrional value of beef. Physicians who tested Effront’s Viandine, as he dubbed it, pronounced it “superior to beef.” Laboratory rats and an undernourished Belgian “workman” both gained weight and good health while eating it. Will we citizens of the twenty-first century, like those a century ago, place our faith in science? Or will we demand solutions to hunger that look to the past rather than science for inspiration --- small, local, natural? *1: The interview with Berthelot is in Henry J. W. Dam, “Foods in the Year 2000,” McClure’s Magazine 3, no. 4 (September 1894): 303-12. *2: “The Non-Beef-Eating Nations,” Saturday Evening Post, November 13, 1869, p. 8. *3: Henry Smith Williams, “The Miracle-Workers: Modern Science in the Industrial World,” Everybody’s Magazine 17 (October 1907): 498. *4: All the Effront quotations are from “Food From Waste Products,” Literary Digest 46 (January 4, 1913): 15-16. For a marvelous survey of how people have imagined and pondered foods and the future, see Warren Belasco, Meals To Come: A History of the Future of Food,” University of California Press, 2006. *5: Quoted in "World's first lab-grown burger is eaten in London."